The Barbados flag was designed by Grantley W. Prescod and adopted on Barbados’ first Independence Day, November 30, 1966. The two vertical ultramarine stripes symbolize the ocean, while the yellow strip between them signifies the island’s sand. 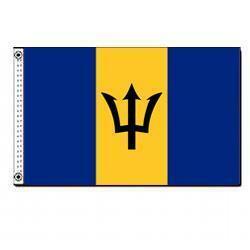 The black broken trident at the flag’s center was taken from Barbados’ colonial badge. The broken staff on the trident signifies a break from British colonial rule. The trident’s three points stand for the three principles of democracy: a government of, for, and by the people.